Maxi skirts are the new mom jeans. That’s an observation AND a declaration for the summer, my friends. And, I plan to thoroughly live up to it. The summer sale racks are overflowing with maxi styles and my weekend afternoons could be spent playing I Spy a Maxi (on the playground, at the market, crossing the street, etc.). But, the best view of a summer maxi I’ve had so far is the twirl-generating, floor-skimming linen skirt I made a few weeks ago and have already worn a million times since. Over the last month, my sewing mojo has been at its peak. I went head first into my wardrobe sewing plan and started plowing through muslins and 1-hour t-shirts like a one-woman factory. For a brief moment though, I was nearly defeated by a streak of wadders and unintentional wearable muslins – garments made with good intentions that lose cool points because of stupid construction mistakes on my part. I channeled that epic fail feeling into a new, scaled back sewing plan (more on that later) that functioned like Ritalin on my haphazard making. This outfit was the first high-five I earned in weeks. It inspired an impromptu photoshoot at the end of an awesomely productive day at the office that I am certain was influenced by how good I felt in my clothes. I’ll give you the top-down tour. The t-shirt marathon that produced this blue rayon jersey top began with a short lesson in twin needle stitching. Where had it been all my life? Constructing the four seams of the fantastically free, Maria Denmark Kimono Tee (get it now if you don’t have it yet) with my serger and then swiveling to my sewing machine for twin needle hemming was the best way to breeze through an already quick sew even faster. Taking the time to hand wind my bobbin with bulky nylon thread slowed my groove a tad, but it was worth it for a functional set of stretchy hem stitches that won’t pop while pulling the shirt on and off. I lengthened the sleeves of this version of the Kimono Tee using Maria’s tutorial and added a narrow wraparound neck binding, my new favorite way to finish a knit neckline. Everything came together so easily and so fast, I looked around the room half expecting someone to tell me I broke the law. Back to this linen maxi skirt with its gorgeous wrinkles and flirty swishyness. I lengthened my go-to dirndl pattern 15 inches and added pockets and a self-drafted waistband. The simplest of simple. I think it’s the light, billowy nature of the linen that gives the skirt life. It catches the air when I walk in such a regal way. During a business trip last week, it was the perfect traveling skirt. I hurried through Dulles and Atlanta airports in my DIY maxi and Keds, letting its soft, rhythmic rustling sound give my strut added purpose. Styling it with a wide belt for this outfit was my second high five moment. With so much fabric on my lower half, I didn’t want to overdo the accessories – the right belt was all I needed to tie the two pieces together. Boom. And, I’m dressed. The most notable fun factor for this skirt is its universal swish appeal. My daughter instinctively grabs the sides when she’s standing next to me and starts swinging the fabric. And when it’s story time, she cuddles up on my lap like it is the coziest toddler hammock in the world. Because it is. What’s your favorite way to wear a maxi skirt? And, why do they always make you feel majestic even when there’s crayons in your pockets and dirt on the hem? This entry was posted in Somethings Sewn and tagged dirndl skirt, kimono tee, linen, maxi skirt, najah-made, sewing blogger, wardrobe architect, wardrobe sewing. Bookmark the permalink. I know what you mean, Sheena. I used to be afraid of what long skirts would do to my five foot frame, but finally gave up on trying to look taller. As long as I honor my curves and proportions, a long skirt (with flats!) works just fine as a petite-friendly style choice. I think you look great – as you say majestic. The two shades of blue work beautifully together. I think maxi dresses and skirts suit all sorts of figures – Mrs Obama look superb in one and she is tall for a lady – but I think the relative fullness of the skirt is key. And the right top. I like a T shirt style myself or something fairly slim fitting to make it look like it is the skirt that is voluminous, not me! Thanks, Kate! I love how Mrs. O wears different hem lengths so well. She’s a giant compared to me, but I’m still inspired by her style. I read recently that a straight maxi can give one the mono leg look and I agree. Even mu daughter can’t rock that look. Kate (above) is right, I think its a small amount of fullness that gives this the edge over the mono leg maxis. Also it looks like you have the proportions down pat, the top to bottom ratio looks right. 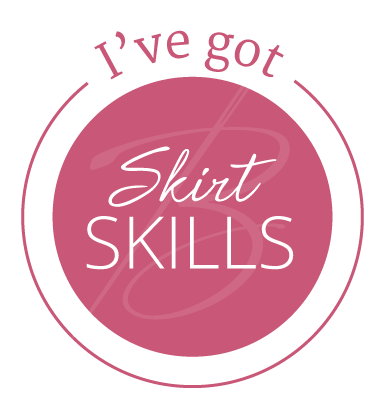 Great skirt, beautiful fabric, a match made in, well, your sewing room as it happens! Thanks!!! So glad you noticed I was going for the right BALANCE. That is definitely the key to pulling off a maxi. My go-to dirndl skirt flares out a tiny bit at the hem and when I lengthened it from knee to floor, that flare got further exaggerated. Thanks, Robin. I have rekindled my love for them this season. The only thing I love more than your actual skirt is the way you describe it! Thanks, Allison. Good sewing makes me prosaic. — “Maxi skirts are the new mom jeans.” — I like that! And I love your outfit. It reminds me that I need to sew more basic stuff instead of always totally obsessing over fun, colorful prints. That obsession over colorful prints is mine too. Been forcing myself (nearly at gunpoint) to get some solids in my closet. Thanks for the comment, Lynn.